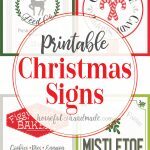 The quickest and easiest way to decorate your home for Christmas is with these vintage inspired printable Christmas Signs. It’s day 5 of our Paper Christmas Decor series. Can you believe we have already made 2 amazing ornaments (gingerbread houses and paper lanterns), 3 easy Christmas trees and the perfect Cookie boxes? 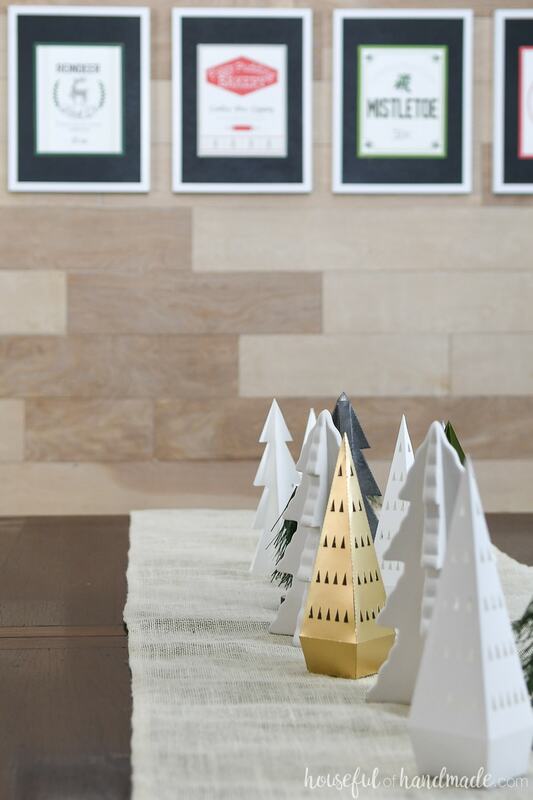 And for even more ideas, check out these 19 Amazing Paper Christmas Decor Ideas. For day 5 there is no assembly required. That is because I used my love of printables to make the cutest vintage inspired Christmas art! Celebrating Christmas with kids is magical! Don’t get me wrong, I loved it before… but now that I have kids to celebrate with, it’s even better! And one of the best parts of Christmas is the magic of Santa. Taking the kids to see Santa. Writing letters to Santa (and then putting them in the cutest Letters to Santa mailbox made from an old cereal box). Making sure to be good so you don’t get coal. It’s all 100 times better with kids. So when I decided to create new Christmas art for our dining room wall, I knew I wanted to include the magic of Santa. These fun signs are my interpretation of the signs you would see if you were visiting Santa’s Village. Of course you would need to visit the Figgy Pudding Bakery, that is the most important part of the village in my eyes. The Christmas cookies, pies and homemade eggnog! Now I am hungry. Then you would go to the stables to visit the reindeer. And on the way you would pass the Reindeer Feed Company, where they have bags of reindeer feed in vintage flour sacks. Heavenly! Next would be a visit the tree farm and take home some mistletoe to remember your visit (taking home an entire tree might be a little too much). And lastly, don’t forget the Candy Cane Candy Shoppe. No trip to the North Pole is complete without a classic candy cane in your pocket. All the magic of Santa’s Village is captured in these vintage inspired signs. But guess what??? I didn’t stop there. I have been so obsessed with the DIY tea towels I made from the apple & pear print that I decided I needed some for Christmas! So I turned the printable Christmas signs into a 1 yard design that can be ordered on Spoonflower here. And because I get really obsessive when I love a new design, I also created a 1 yard of fabric that makes 3 Christmas covers forms. The fronts are 3 of my favorite Christmas signs and the back are Christmas plaids & buffalo check. I will be making a tutorial on how to sew up these cute pillow covers very soon. But you can order the Christmas pillow cover fabric here so you have plenty of time before Christmas. Once you have printed your four printable Santa’s Village Signs, you will need a plan to use them! 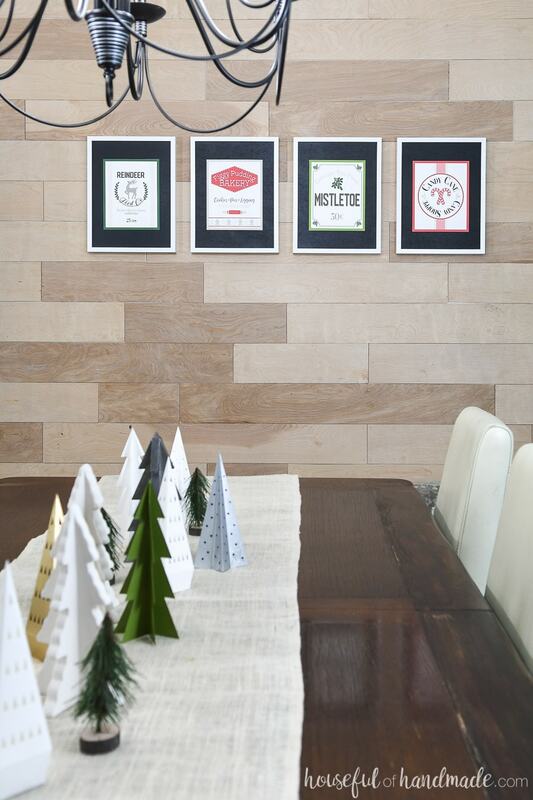 Here are some of my favorite ways to decorate with printables each season. 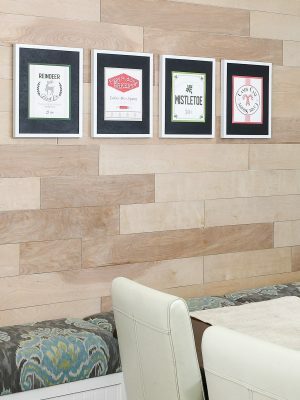 Create a gallery wall of inexpensive picture frames that you can easily add new printable to each season. 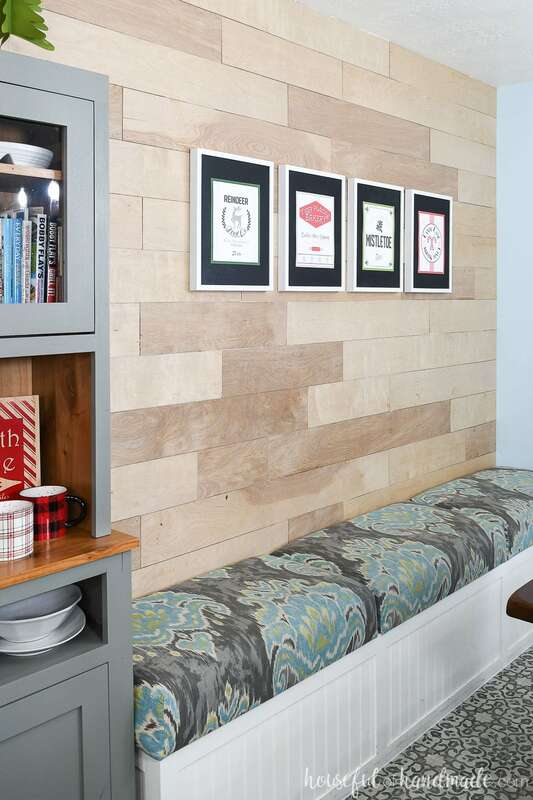 Use clipboard picture frames (like this DIY beadboard picture frame) on shelves or in bookcases to hang printables. 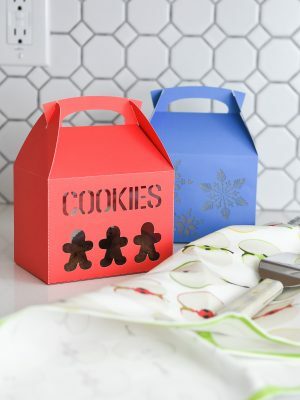 Clip printables into wooden pant hangers and hang wherever you want a little seasonal decor. Make some 20 minute picture frames for your printables and place them on your mantel. Print out your favorite printable and Mod-Podge it to a piece of wood for an instant wood sign. Laminate the printable and punch a hole in the top corners for a quick (and inexpensive) plastic sign. Printables can be used for great handmade gifts too! Why not share the Christmas spirit with your friends and family by turning these printables into the following DIY gifts. 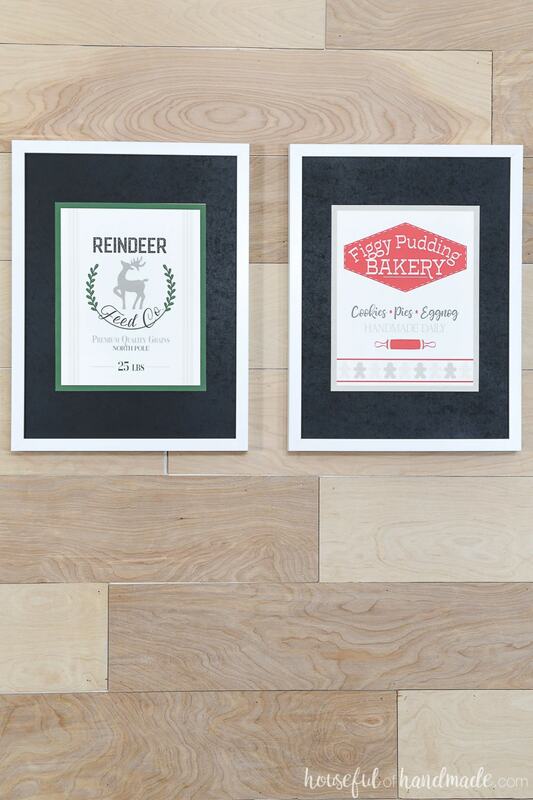 Mod-Podge the Figgy Pudding Bakery sign to a piece of wood and package it with your favorite homemade cookie mix. 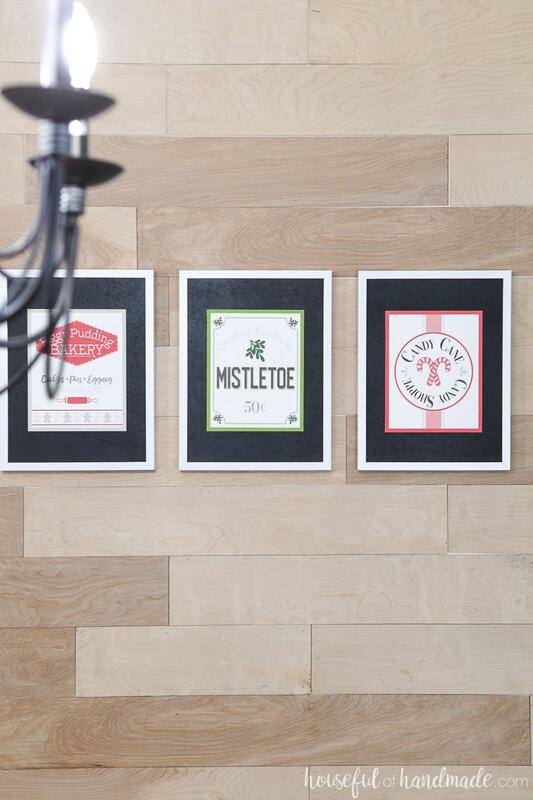 Give a sprig of fresh mistletoe and a laminated Mistletoe for sale sign for a simple hostess gift. Make magical Reindeer Food and gift them with a framed Reindeer Feed Co. sign (perfect for families with kids). 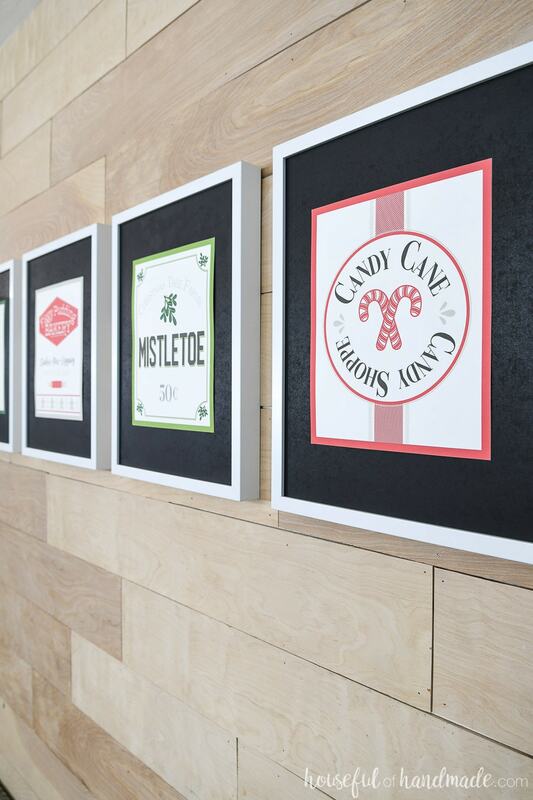 Build a fun picture frame for the Candy Cane Candy Shoppe sign and give it with a box of candy canes. **Remember, these printables are for personal use only! Feel free to make gifts to give yourself. If you would like to make gifts to sell, please contact me about a commercial use license. The PDF Christmas signs were free for my subscribers until 11/25/2018. Now they are available for purchase in the shop. Make sure to subscribe so you will be notified of new freebies! 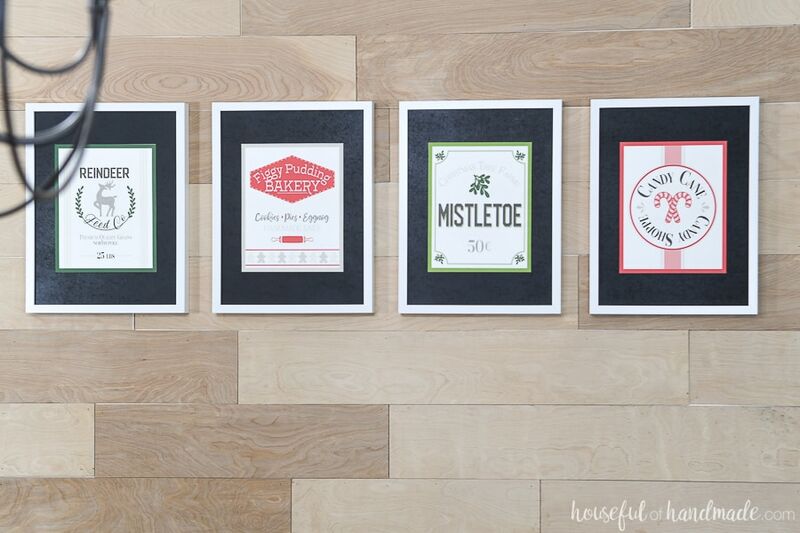 And for more printable Christmas signs, check out these Christmas Seed Packet Art Printables. 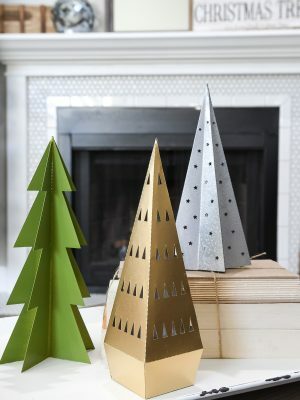 Don’t forget to come back tomorrow for Day 6 of the 7 Days of Paper Christmas Decor. We are so close to having the home decorated. You won’t want to miss out on anything!